Founding a eucharistic religious order was a logical extension of the eucharistic spirituality Eymard was developing. In his first, tentative reference to the concept in a letter to Marguerite Guillot in April 1853, Eymard said he wanted to do great things for God. He believed this great idea came from God, but he was also terrified that he was not great enough to implement it. He asked Guillot to pray. Typically, he did not rely entirely on prayer. He also asked the Dominican master-general (Fr Vincent-Alexandre Jandel) to put the idea before Pope Pius IX. Jandel later reported that the pope had viewed the concept favourably. 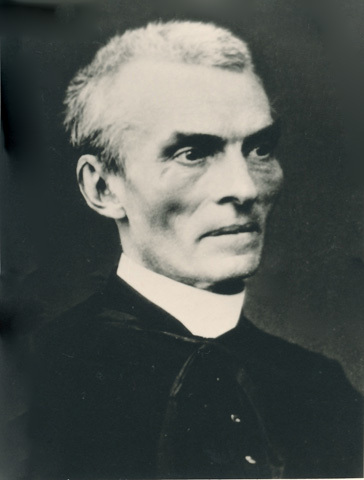 During his Le Seyne years, Eymard also maintained contact with Raymond de Cuers, who was ordained a diocesan priest at Marseilles in June 1855. Both Eymard and de Cuers were involved in what Guitton calls a ‘holy plot’, planning for the new order and steering selected Marist aspirants towards its ideals. The role of de Cuers at this time should not be underestimated. Cave has described de Cuers as a driving force. By May 1855 Eymard had drafted various rules or Constitutions for the future eucharistic congregation. It also seems that Colin had been thinking about establishing a Marist community dedicated to adoration of the eucharist, before stepping down as superior-general in May 1853. However, Colin’s successor, Fr Julien Favre, was not receptive in June 1855 when Eymard attempted to promote his eucharistic ideas. ‘You are a Marist before all else. . .’, Favre warned, and he instructed Eymard to abandon his eucharistic projects. Eymard would not be stopped. He believed that God was ‘urging’ him on. Holy Father . . . Why does the greatest of all mysteries not have its own religious group like the other mysteries; why would it not have men with a perpetual mission of prayer at the feet of Jesus in his divine Sacrament?
. . . The Society of the Most Blessed Sacrament would not limit itself to this mission of prayer and contemplation. It would dedicate itself apostolically to the salvation of souls by using all the [necessary] means inspired by a wise zeal enlightened by the charity of Jesus Christ. It would work to lead to the feet of Jesus Eucharistic as many adorers as possible, by forming associations of adorers in the world, by giving private and public retreats for men in their Cenacle, especially for secular priests . . . The Society would gladly embrace all the works of zeal which concern the adorable Eucharist, such as 40 hour devotions, clergy retreats, preparations for first Communions, etc . . .
Eymard added that six priests and six philosophy students were ready to support ‘this Eucharistic project’, but his superior Father Favre ‘does not want to favour it outside of the Society of Mary’. Nor would Favre allow Eymard to work on its behalf without the approval of the pope. After sixteen years as a religious, Eymard argued, he had now been relieved of the major posts he had held and he believed his ‘withdrawal’ would not adversely affect the Marist order. Later, Touche told Eymard that the pope had declared: ‘The work comes from God, of that I am convinced, the Church needs it, let one take every means possible to make the divine Eucharist known.’ Nevertheless, Touche said, it was also the pope’s wish that ‘the Marist priest [Eymard] be in agreement with his Superior and the local Bishop for the setting up of the work’. Thus, while Pope Pius IX could have given Eymard permission to proceed, he refrained, preferring instead that Eymard first obtain the co-operation or approval of his own order. But Favre was in no hurry to verify Touche’s report. He left the matter unresolved, and any doubts concerning his disposition were probably removed when Eymard was forbidden to write to the Society’s aspirants, some of whom Favre had learned were backing de Cuers and Eymard’s eucharistic plans. Suddenly, Eymard found himself relieved of duties at La Seyne and transferred to the Marist novitiate at Chaintre for a ‘rest’. ‘I suffer and I hope’, Eymard wrote. Favre did not reject eucharistic devotion in itself. He told de Cuers this work was ‘beautiful’, but Marist spirituality emphasized the Virgin Mary. Favre doubted the ‘fit’ was close enough to the order’s objectives or ‘apostolate’, and he did not want to lose an experienced priest like Eymard. In what seems like an effort to settle the issue, in February 1856 Favre asked whether Eymard would accept the pope’s decision if he personally presented the eucharistic project to the pope. Naturally, Eymard agreed. Privately, he believed Favre would try to persuade the pope not to allow Eymard a dispensation because of its impact on the order. I intended to speak to the pope about this, but during my visit I totally forgot. God no doubt permitted this. Therefore, we must settle this matter. Either you put this aside, or you leave the Society. But if you leave, I will not dispense you from your vows.